Add gentle color to your garden with the Apricot Drift Rose. This plant is great for borders, hillsides or even hanging baskets. It produces double clusters of delicate roses in contrast to the glossy green foliage. It will flower from spring to first frost wherever you plant it, giving your garden color all through the growing season. Don’t be fooled by this rose’s delicate appearance it’s tough enough to survive in zones 4-11 and can withstand many diseases that commonly affect roses. 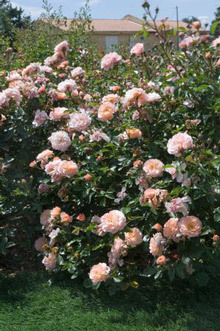 Apricot Drift is a low spreading ground cover rose which will reach around 1-2 feet in height at full maturity and spreads out about 1 ½ to 2 feet. It’s just the thing for perennial beds or walkways. Beautiful color Compact and fast growing Winter hardy Resistant to rust, black-spot and powdery mildew Requires no pruning to maintain shape Plentiful and continuous flowering Great for all areas even small gardens and unwieldy spaces Drought tolerant Great for companion planting - this groundcover rose will gently spread round your established plants.